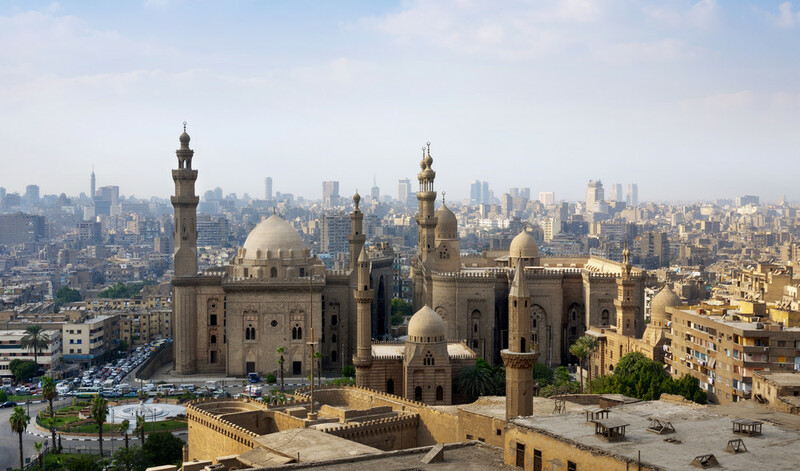 Cairo has always lured in visitors with the pyramids and the allure of the exotic and unknown. But there is more to this remarkable and dynamic city than the Great Pyramids of Giza. Cairo is a vast city of vibrancy and diversity; it would take years to see it fully – and perhaps more than a lifetime to truly understand it. Post-2011, the exorbitant crowds and prices that were once famously associated with the city have all but disappeared. 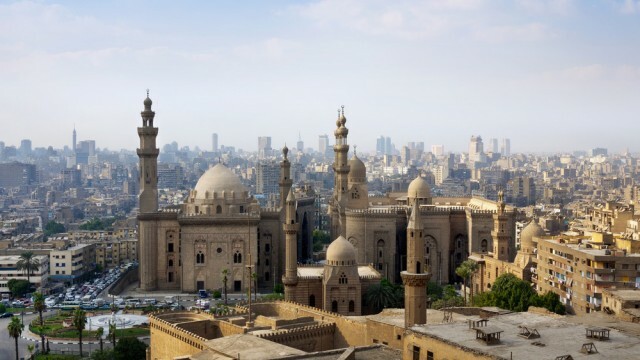 However, before illusions of tranquility mislead you, remember that Cairo as a mega city remains home to millions of inhabitants, making it the largest city in the Middle East (which is is culturally and politically part of) and the second-largest on the African continent (after Lagos, Nigeria). It remains anything but relaxing – but ever the more remarkable. A visit to Cairo inevitably begins with the Pyramids of Giza, located on the ever-encroaching edge of the city of Giza. Connected to central Cairo by metro, taxi or bus, Giza has long since been absorbed into Cairo’s broader sprawl. The tips of the three pyramids pop out behind McDonald’s arches and rooftops, and the density of trinket-vendors and tour operators around you closely correlates with your proximity to these iconic landmarks. You’ll have the option to approach these wonders through the deserts on the back of a camel – or by foot on the walkways. You may just be treated to a quiet stroll in and around the three pyramids and the Sphinx – or to a near-solo evening sound and light show. A visit to the pyramids is most often coupled with a tour through the artifact-packed Egyptian Museum. Within these walls, you will find some of the region’s most famed treasures, including the death mask of Tutankhamun and massive statues of pharaohs. Though information explaining the artifacts is notoriously sparse, the sheer volume of Pharonic antiquities keeps this museum as a city must-see (… you’d be wise to bring an external guide book). From the Egyptian Museum, you are a mere 250m away from Tahrir Square. This literal and symbolic heart of the city has been the rallying point for demonstrations – both peaceful and violent – during and following the Arab Spring. On an average day however, the square looks deceptively mundane – in a chaotic Egyptian way, that is. Traffic and pedestrians swirl around the central roundabout, with the odd piece of revolutionary art noticeable on side streets. Khan El-Khalili – to shop in an expansive bazar, filled to the brim with treasures, trinkets, junk and talented vendors (… be prepared to haggle). Accommodation in Cairo is enormously varied, spanning from tiny backpacker nooks, like Hostel Luna, right through to ultra-luxury hotels like the Four Seasons Cairo and the Ritz Carlton. Between the two extremes, you will find a number of boutique hotels like Le Riad, many recognized international chains like Hilton, plus almost every other option imaginable. Virtually all hotels will accept major credit cards or cash. Online reservations are generally available and advisable. The Cairo culinary scene is certainly one that warrants exploration – which may come as a surprise to some. Many of the best flavors emerge out of street side vendors, given that the restaurant scene remains relatively underdeveloped. Koshari is the quintessential Egyptian street food. Though occasionally likened to glorified leftovers, there is something to be said about the fusion of carbohydrates (rice, lentils, chickpeas, noodles and macaroni), tomatoes, a medley of spices, and delightfully crispy onions. With vendors located on most corners, a trip to Cairo can quickly be consumed by searching for the single best bowl. Teas, coffees and fruit juices rival koshari in terms of local popularity. Coffee shops speckle the streets, offering up these three beverages alongside an array of flavours of sheesha. Fishawi’s Café is a longstanding favourite, given that it claims to have been continuously open since 1773 – but again, a trip could be consumed by searching for your perfect café. In addition to sampling coffee and mint tea, a coctel is well worth a sip. With layers of berries, bananas, mango pulp and yogurt piled one on top of another in one hand, and a sheesha in the other, you’ll quickly adjust to the pulse of the city on a warm summer’s evening. Of course the streets are also inundated with shwarma, falafel and other sandwich stands. Most exist between or beside a growing number of international fast food chains (McDonalds, KFC, Pizza Hut) and numerous Asian restaurants, should you crave the familiar. To get to Cairo from outside the country, most travellers fly into Cairo International Airport (CAI), which is connected to major cities by a number of different airlines. To get to Cairo from other parts of Egypt, you can either choose domestic flights (EgyptAir Express is the major carrier), train, or road (public buses, private vehicles, and shared shuttle are among the options). Most Egyptians take the bus. The main bus station is in Ramses Square. To get to the city from the airport you can either take an airport shuttle, or a “limousine service” (like a taxi but with a fixed price). Many hotels can send a driver pick to you up at the airport if you arrange it in advance, and they will add the cost to your hotel bill. Within Cairo, you have the option of traveling by private or public transport. Private transport options include car rentals and taxis (including Uber). You can hail a taxi quite easily – but you’ll want to try to get a solid white taxi. These cars are more comfortable and use a meter, making them cheaper for foreigners when compared to black and white taxis. Once in a vehicle, don’t expect to arrive anywhere quickly. Traffic in Cairo is among the most oppressive worldwide. Public transport consists of buses and the metro. Cairo’s metro was the first on the continent (and it’s one of only two in Africa), making it an experience in and of itself. Though hectic at particular times of day, the incredibly low price makes this a worthwhile way to navigate the city. The metro does have limited coverage, but you can connect with buses for destinations further afield. Location: Cairo is located in the northern part of Egypt, at the mouth of the Nile River delta, about 220 km (137 mi) from Alexandria and the Mediterranean sea. Languages: The primary language of Egypt is Arabic, but in touristed areas many vendors and tour guides have at least some knowledge of English and often other European languages. Weather: The weather is very cool in winter, and very dry and hot in summer. Average January daytime temps are 14C/56F, and average July temps are 28C/82F. But bear in mind it can spike to 35C/94F on hot summer days, and drop to 9C/48F on cold winter nights, so pack accordingly. Bring loose, light layers for summer, and a warm coat for winter. Money and banking: The Egyptian pound is the currency in Cairo. Being an international metropolis, banks and ATMs are abundant almost everywhere, but its safest to use the ATMs and change bureaus in major hotels or banks such as HSBC or National Bank of Egypt. Most hotels, restaurants and shops that are tourist-oriented will accept credit cards such as Visa and Mastercard (just not American Express). Tipping and local customs: Anybody who provides you any type of service in Cairo will expect a tip or “baksheesh.” At restaurants 10% is standard, even if you see a gratuity added to your bill. For bellmen, tip a minimum of five pounds per bag and hotel maids 5-10 pounds per night. Taxi drivers who take you on short jaunts around the city don’t need to be tipped, but if you hire a driver for the day, give him 40 pounds is about the going tip rate. If you’re taking a Nile cruise, the minimum tip is 20 pounds per person per night. Safety: The safety situation in Cairo has been changing rapidly. There is some added risk when booking a trip because there is the potential for occasional flare-ups of political violence. Obviously, it’s ideal to avoid being near the scene of a protest or march, but other than that, the ongoing problems in Cairo should not impede your trip. Of course you should always consult security updates and travel advisories at the time of planning to find out the latest information. One of the biggest issues some women face in Cairo is street harassment and groping from men. If possible, women should go out with a male companion, which seems to deter this activity. If this isn’t possible, try to go with a group of women. You still might be harassed, but there’s security in numbers. If you must go out alone as a woman, try to wear loose clothing and steer clear of crowded markets and public transit, unless you like getting felt up and propositioned. If it does happen, a stern “no!” or otherwise assertively drawing attention to the misbehavior (and publicly shaming the perpetrator) goes a long way toward stopping it. This article was originally published April 16, 2015. Lindsay is a Canadian freelance travel writer and photographer who spent 10 years exploring the world, including a stint as a volunteer in Uganda. She writes for various blogs, magazines and newspapers. Her work can be seen at www.lindsayseegmiller.com.